You always hear about how Bear Bryant and Pat Dye were friends, but like good friends, friends who went hunting together and had pictures of themselves hunting and stuff, and that they maybe even had a protege / mentor thing going on. And to me at least, there was always kind of the implication that it wasn’t just because Dye was an assistant for Bryant at Alabama. It was, like, they couldn’t help but be friends.. that they shared some deep, generation-spanning understanding and appreciation of each other as southern football men or something. Of course most of that feeling comes from things Dye has said over the years, about how Bear supposedly tried to talking him out of taking the Auburn job. And you just kind of wonder if maybe he was exaggerating a bit. Sure, they both talked country and stuff, but did they really talk country to each other on a regular basis even before Dye moved to the Plains? Were they really close friends? Was Bear Bryant even capable of friendship? Did he really attempt to thwart the Dye-era at Auburn? Phil Snow: Would you rather not have a guy as close as Pat is to you be the coach at Auburn? 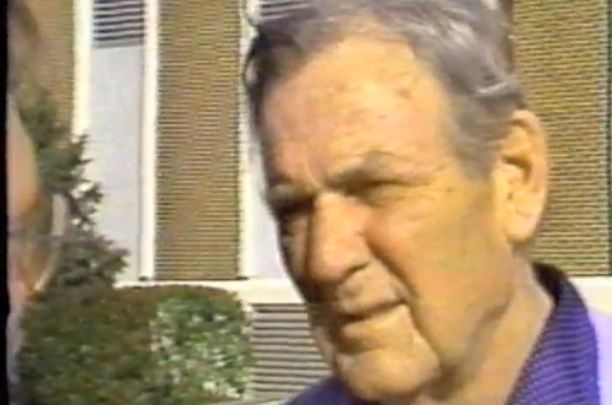 Bear Bryant: Yeah, I’d rather he wouldn’t be the coach at Auburn. Snow: Why is that, coach? Bryant: Because he’s a friend of mine. I want him to continue to be a friend of mine, but it’s difficult to be as close as ones like we were and be cross state rivals. And I don’t want those Auburn people ruining him anyway. Snow: Did you try to talk him out of taking the job? Bryant: No, I didn’t try to talk him out… we talked before he was ever offered the job, before he was ever interviewed. I let him I know I didn’t think he should be goin’ down there I think. He didn’t pay any attention to me, naturally. Related: Bear Bryant, Auburn fan? Uhhh, what? He’s like the Bob Dylan of college football.